Backyard oasis is an understatement at this great new listing*in 2017 owners added over 100K in the backyard alone*One of the largest covered patios you will ever find! 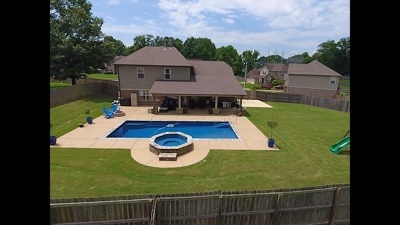 There is also a salt water pool & spa, fire pit & basketball area*This one checks all the boxes with at home entertainment*In the kitchen you will find double ovens & gas cooktop*The master bedroom is downstairs & there are 3 bedrooms + an office + a bonus room up*Come on & get your splash on! !